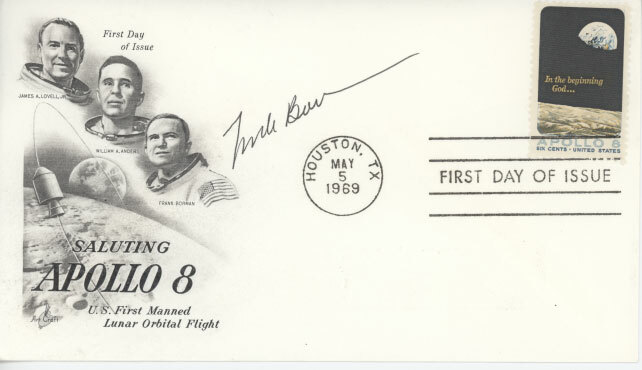 Index card measuring 5"x3" signed boldly in black sharpie by Frank Borman. Event cover commemorating the first live TV from the Moon on Dec. 24, 1968. Cancelled on that date in Port Washington, NY. 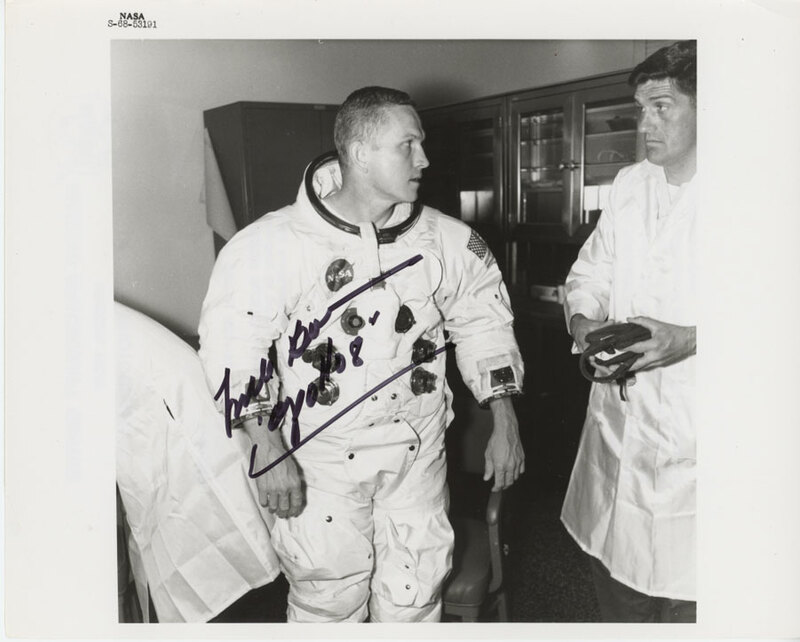 Nicely signeed by Frank Borman in black sharpie. Apollo 8 launch NASA Press Release glossy. 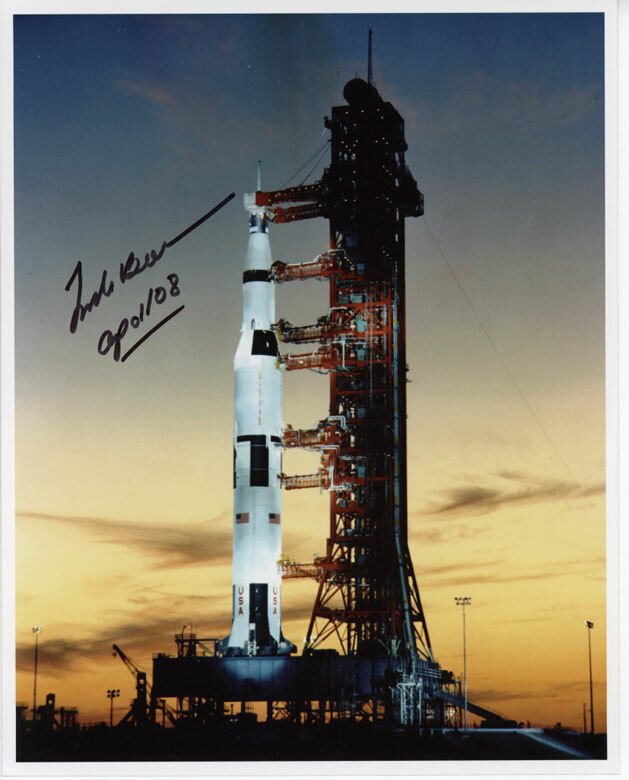 Beautifully hand signed in black sharpie by Frank Borman. NASA information on back. Beautiful condition. Apollo 8 on the pad. 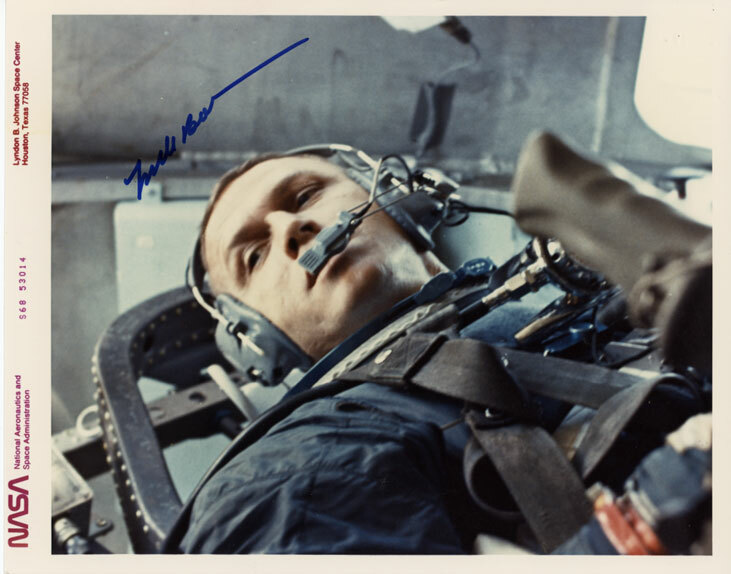 Beautifully hand signed in black sharpie by Frank Borman who adds mission information. Black sharpie, 8x10 and pristine. NASA Press Release glossy with stamped info on back per usual. 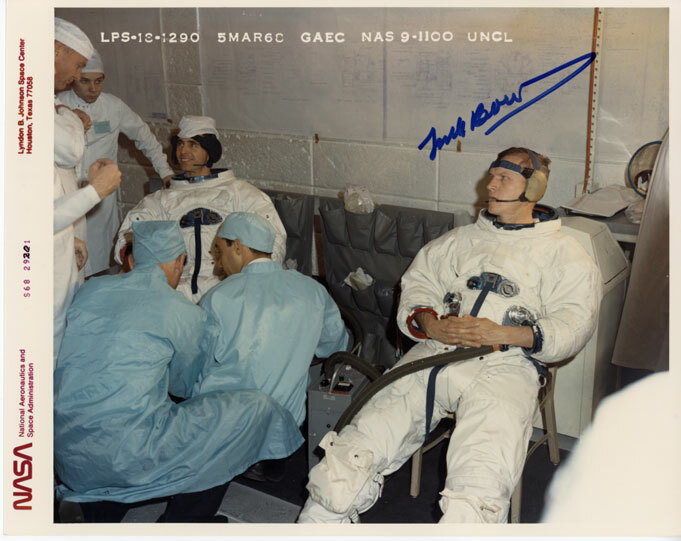 Image shows crew in training for their upcoming Apollo 8 flight to the moon. Beautiful condition. Vintage NASA Press Release glossy with stamped info on back per usual. Note some denting in upper left quadrant from handling. 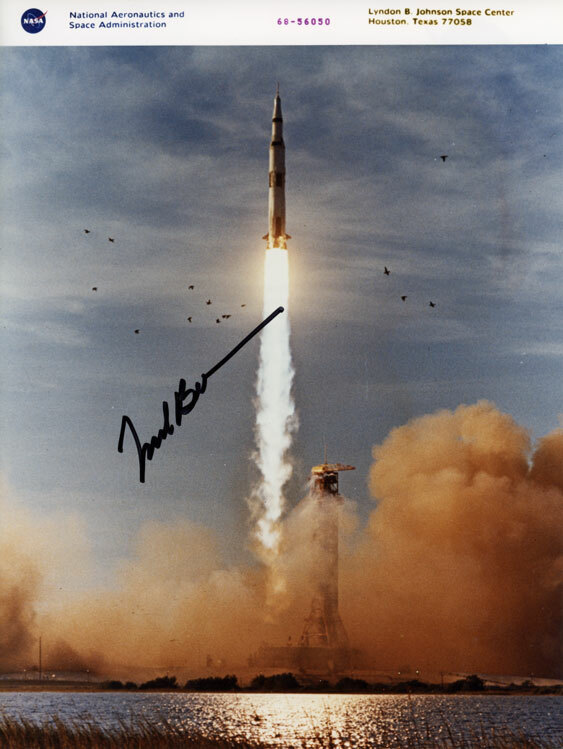 Still, not easy to see without being held to light at just the right angle with otherwise bold signature with "Apollo 8" added in black sharpie. Vintage NASA Press Release glossy with stamped info on back per usual. Note light crease on lower right border toward very edge. Otherwise in awesome condition. Hand signed in blue sharpie. Measures 8x10. 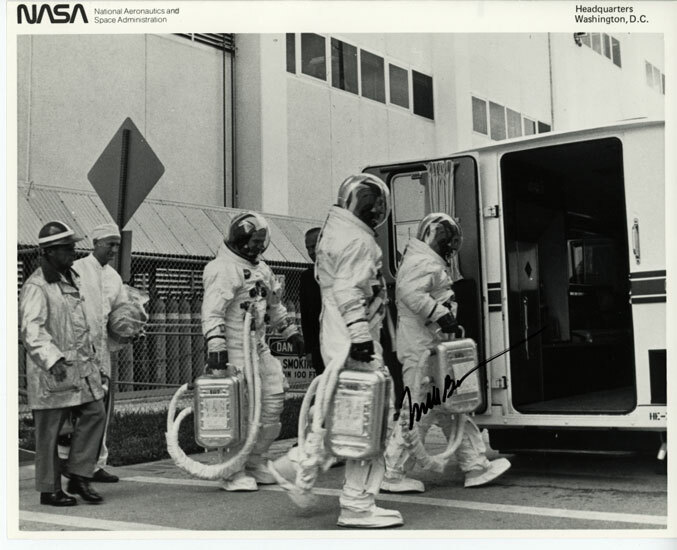 NASA vintage Press Release Glossy SP taken during Lunar Module System Test (LTA-1) in March 1968. 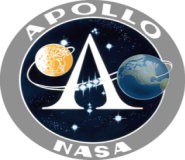 NASA Press Release photo taken during training for Apollo 8. Hand signed in blue sharpie with NASA information in back as usual. Outstanding condition. Measures 8x10. added. (note some denting to this vintage photo with a bend in the lower left border). 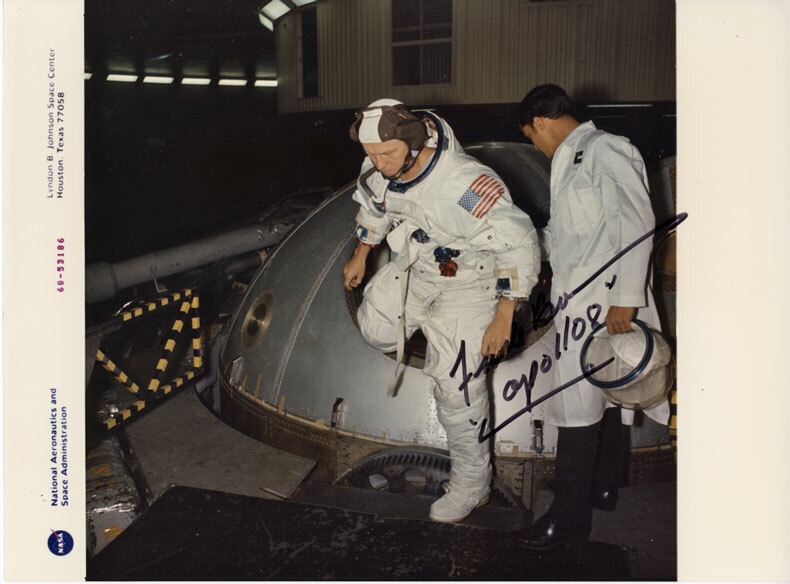 Still a very nice vintage photo of Borman during centrifuge training. 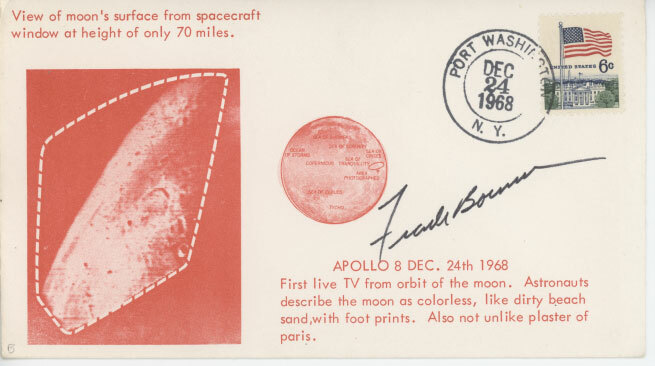 This Space Shot card (#0020) measuring 2.5" x 3.5" is a wonderful shot of the moon's far side as seen by Frank Borman on his Apollo 8 mission. 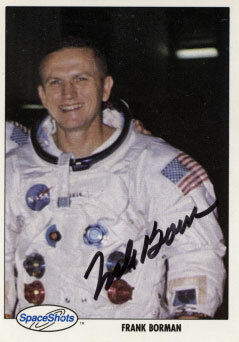 It is hand signed by Borman in bold black sharpie and is in pristine condition. 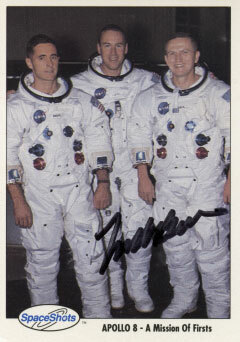 Space Shots card #0002 hand signed by Frank Borman in black sharpie. Pristine condition. 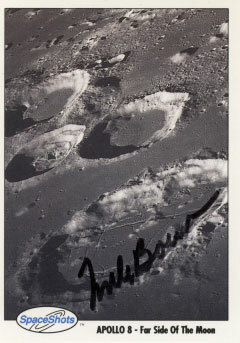 Space Shots card #0058 hand signed by Frank Borman in black sharpie. Pristine condition. 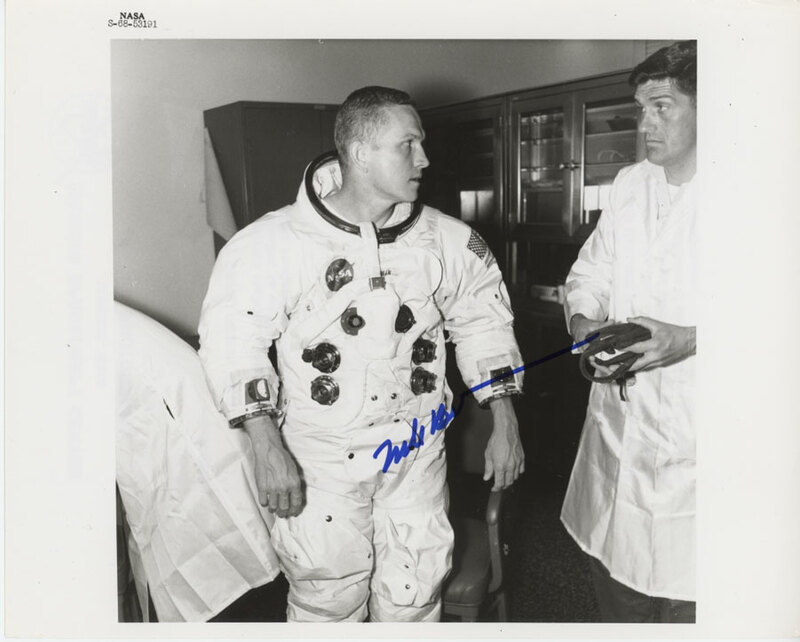 Vintage NASA litho business suit portrait hand signed in bold black sharpie by James Lovell. Outstandnig condition. Measures 8" x 10".James Lovell in training for his Apollo 9 flight. 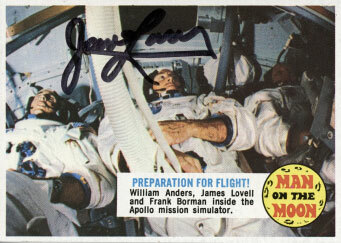 This vintage "Man On The Moon" trading card is hand signed by Lovell in black sharpie. Pristine condition. 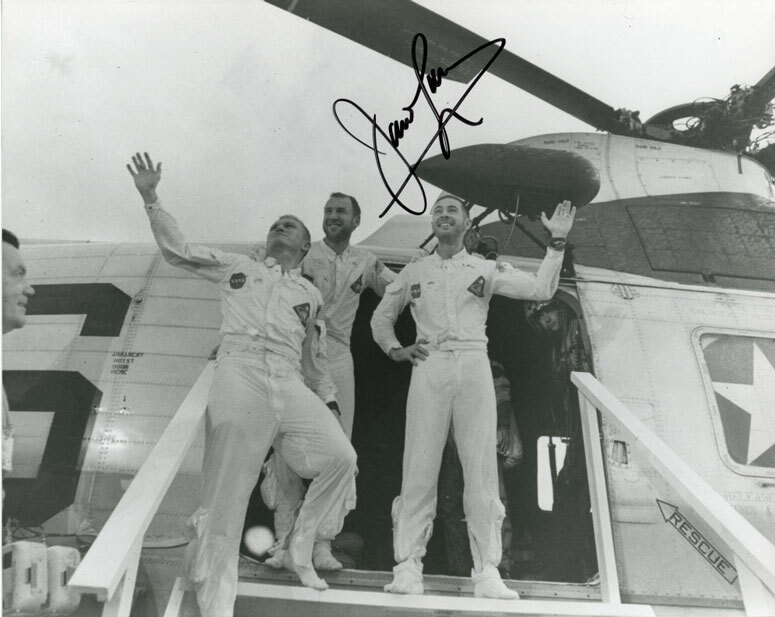 Image is hand signed in black sharpie by James Lovell. Photo is in outstandnig condition. Measures 8" x 10". Apollo 8 Saturn on launch pad. 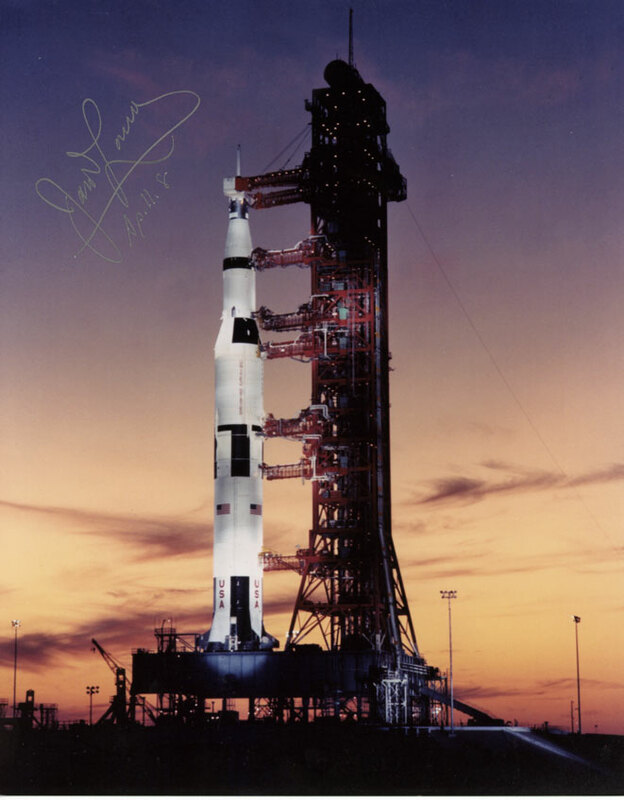 This 8"x10" color glossy is beautifully hand signed in silver sharpie by James Lovell who adds "Apollo 8".